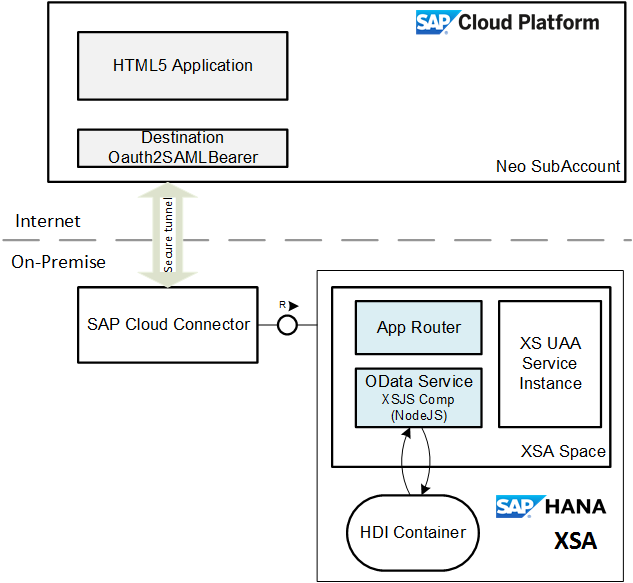 Recently, I came across a situation where I had to consume an OData service that’s deployed in HANA 2.0 on-premise following XSA paradigm in a SAPUI5 application running in SAP Cloud Platform – Neo environment. 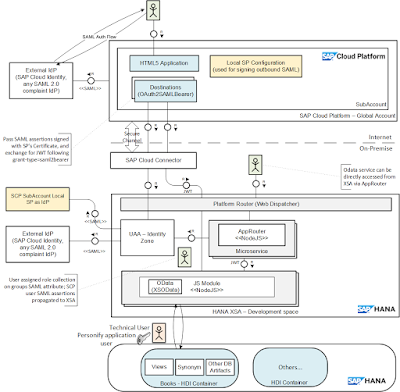 In this blog, I’d like to take through the concepts and the various configuration steps that are involved in setting up communication channel between an application deployed in SCP to and HANA XSA on-premise. I’ll also describe in detail the security configuration to allow a user logged in SCP HTML5 application to access a protected resource in HANA XSA, for example an OData service that requires specific scope to access. Assumption: I assume that you have setup your XSA environment with an external IdP. And that you are familiar with using Application Role Builder, Role Collection and assigning Role Collection to user from XSA Admin Cockpit. 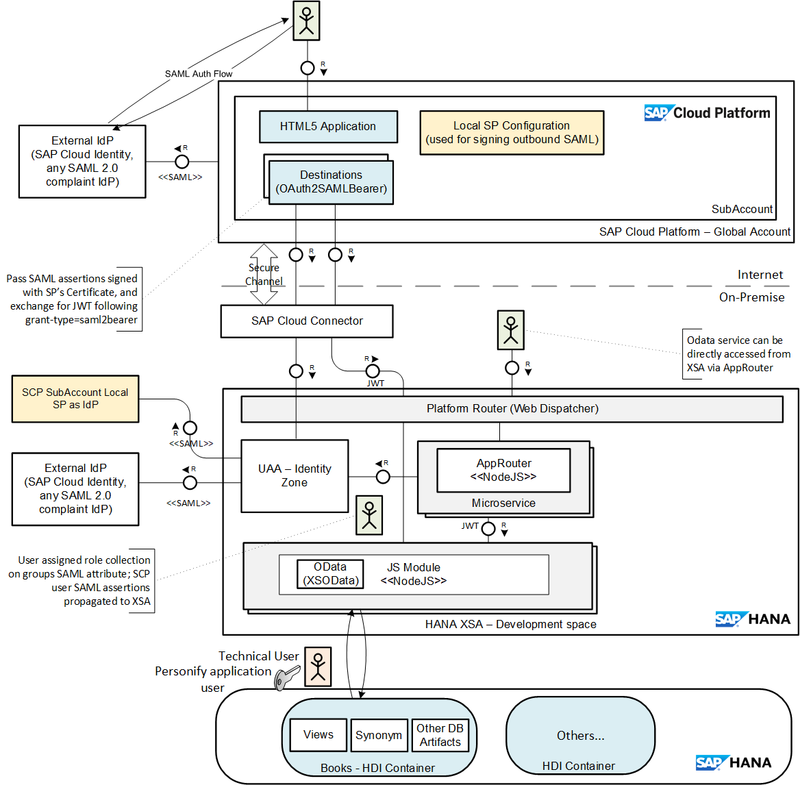 To explain the steps in this document, let’s take a simple HANA XSA application following MTA paradigm containing db (hdi-container), js and an approuter module. ◈ The approuter module defines the routes in the xs-app.json along with the scopes required. As you know, this acts as the single entry point for the application, and also takes care of user authentication and authorization (partly, since the backend (js module) also needs to check the user has relevant scopes), and forwarding and caching of the JWT for the logged in user. 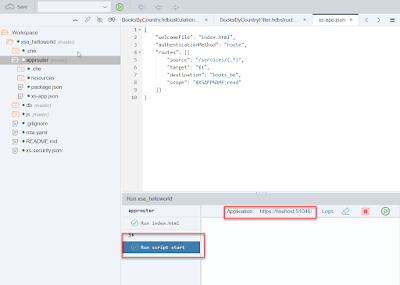 Let’s also define a xs-security.json file that would define the required scope, attributes and role template for the application described above. In your xs-app.json and in the odata definition, you can check the scope “read” for accessing the protected resource. 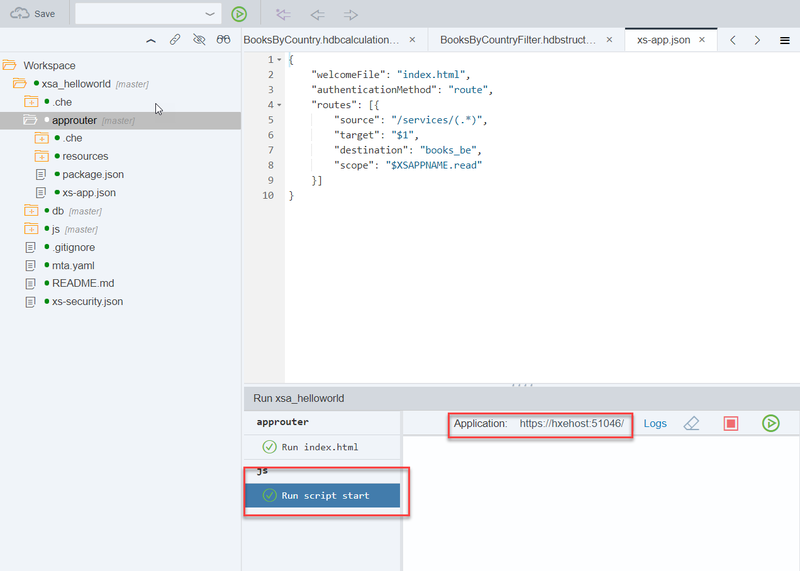 And the attribute country will be used in the structured privilege on calculation view to filter rows based on the user accessing the calculation view. "description": "Read access to the odata service"
And there’s a simple UI5 application that’s display the data from the OData service. 1. The user logs in to the HTML5 application authenticated by the external IdP. 4. The JWT token fetched in the previous step is then sent in the header Authorization: Bearer <JWT_Token> to the backend service. Please note that here, we don’t invoke the App Router but then the actual service itself (js module). 5. The backend service should check that user the required scope to the access the protected endpoint. 6. As you already know access to DB in XSA is with single technical user. However, the application user is personified onto the technical user giving the JWT token. The user attributes are set at the global variables for the session and can be used in the instance based authorization in the database artifacts like Structured Privileges. The steps that are explained above are taken care of implicitly by the destination configured in SCP. 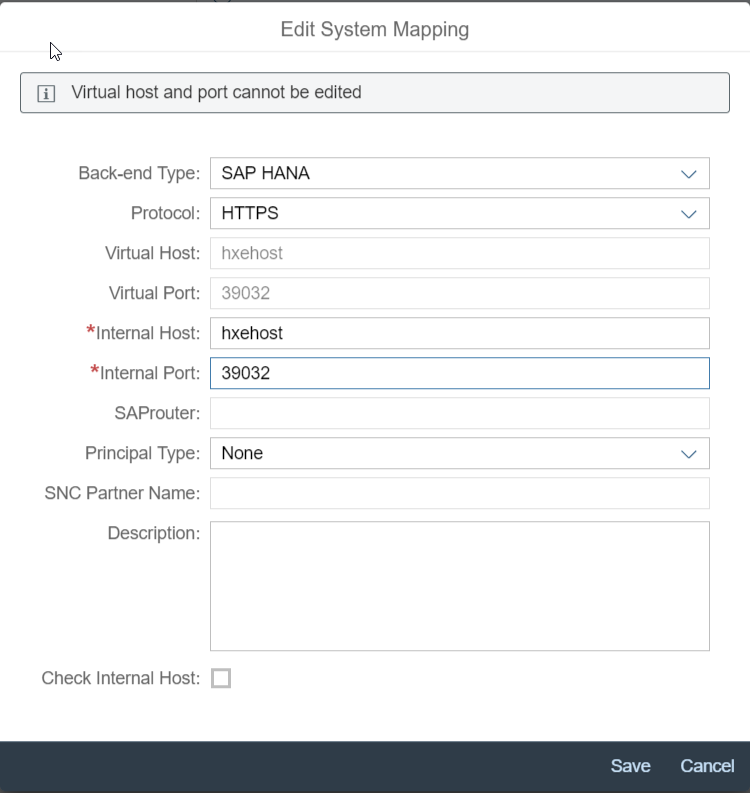 Since the XSUAA is running on-premise, it’s required to expose these endpoints as virtual mapping from the cloud connector. The destination service takes care of performing this complex flow, and fetching the service result to the browser client. 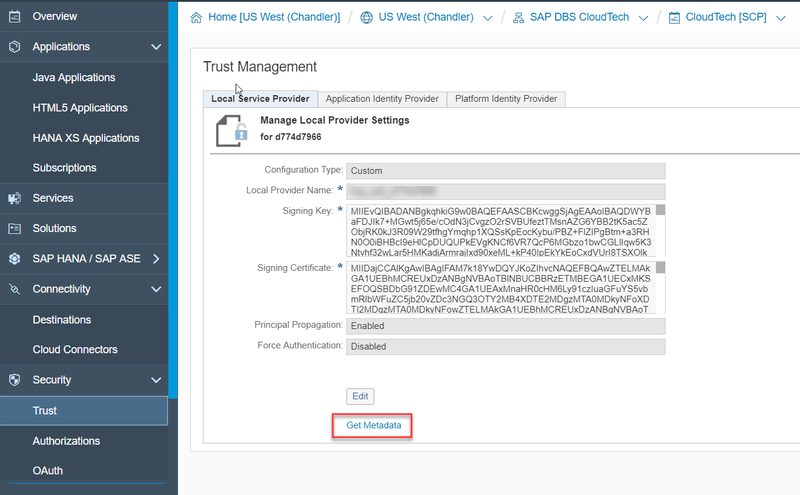 I have used an SAP Cloud Platform Identity Authentication Service (IAS) tenant to demonstrate the setup here. The steps should work with any other SAML2.0 IdP as well. Please note, I’ll not go through all the steps below – since some of them can be looked up from the Reference Guide, and I’ve provided the links to the documentation for the same. I’d explain in detail the steps in the following sections that are specific to the setup discussed in this blog. I hope you have already configured an external IdP for authenticating business user to access the application in XSA. You can refer the documentation from the table above. 2. Select the IdP that you have configured. From the Role Collections tab, add the Role Collections that you have already created “BooksOrganizer”, and then assign the “Groups” attribute value. 3. When a user logs in via IdP, the user gets federated to the role collections which matches to the Groups SAML assertion attribute that the logged user carries in his SAML Assertion attribute statement. You can register XSA as Service Provider with any SAML2.0 complaint IdP. 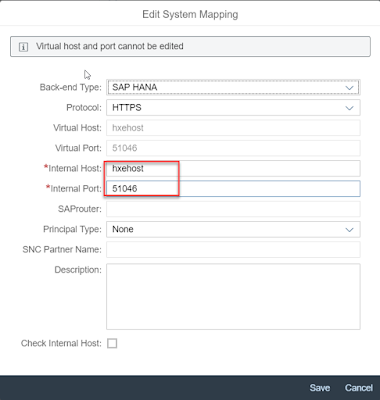 In the table above, I’ve given the link for configuring with IAS tenant (SaaS). 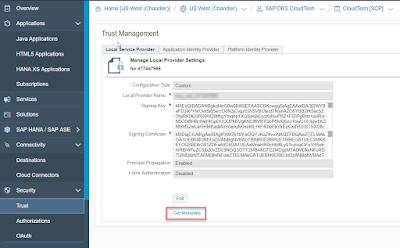 Once you have SAML trust setup, you can then add the Role Collection assignment to user logging in from IdP via the Groups attribute. From your IdP, make sure that you send the assertion attribute “Groups” (which decides the role collection that user will be federated) and “country”(used for instance based auth in our example) attribute that we will be using later on. You can try to access the odata service via AppRouter, and then you’d see the link for the IdP below the default form login. 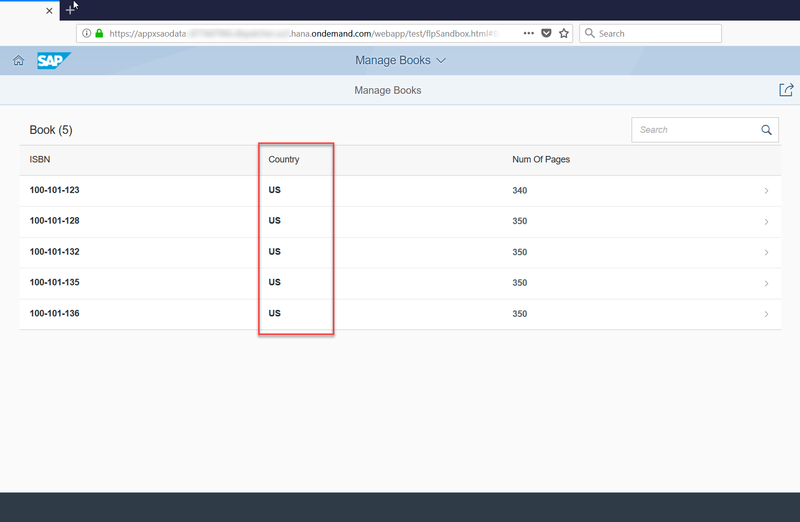 You can then login with a valid user from IdP who has the User Group “BooksOrgUserGroup” assigned so that he gets the Role Collection “BooksOrganizer” and is able to access the service. 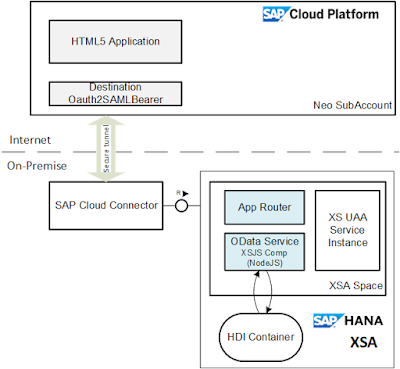 Now that you are able to access the OData service from XSA directly via AppRouter, the next step will be to consume the same from the UI5 application deployed in SCP Neo. I assume that you have already setup SAP Cloud Connector (SCC), and you have established the tunnel for your subaccount on SCP (Neo). You can refer to other blogs, that would describe the basic setup in detail. In here, I’ll focus on setting up the Virtual that are specific to the consume the service from XSA On-premise. We’ll need to create two Virtual endpoints for the on-premise system, one to access the odata service, and the other access the UAA token service. 2. Select the SCP subaccount to which the backend services has to be exposed. A sample configuration is shown below. In this section, we’ll configure to expose the backend service endpoints. Fetch the backend service endpoints (js module). Please note, in this case we go to the backend Node JS service directly, and not via the AppRouter. You can create virtual mapping and the resources as shown in the images below. 2. Create the destination with the following details. 3. Test the connection to ensure that the system is reachable. I assume that you have configured your Neo Subaccount with an external IdP. When the user is propagated from the SCP HTML5 application to XSA, the Local Service Provider in SCP SubAccount will act as the IdP for XSA. The outbound SAML assertion will be signed by the SP’s signing certificate. For this purpose, we’ll have to download SP metadata. 1. From the subaccount cockpit, Go to Security → Trust, and then open the Local Service Provider tab. 2. Download the SP metadata by clicking on the “Get Metadata” link. 3. Since the RoleCollection assignment to user is based on the Groups attribute passed, it’s important to send that as an Assertion attribute from SCP. This is achieved by setting the Assertion attribute. 3.2 Go to Attributes tab, and then add the Groups attribute into the section Assertion-Based Attributes. 3.3 If there are more attributes to be passed to XSA for row level access (instance based authorization), all of them has to be added to the list here. You can set all attributes passed from IdP as Principal attributes by just entering * in Assertion & Principal Attribute. Finally, we will now add the Local Service Provider of SCP SubAccount as an IdP to XSA. I created a simple Fiori list report application (from the project template). In the step where it asks for you select the odata service, you can select from the destination that you have created. You can go ahead and then complete the application. The goal of this application is to show that based on the user logging in, the data fetched from the odata service is filtered based on the attributes configured for him in his IdP. 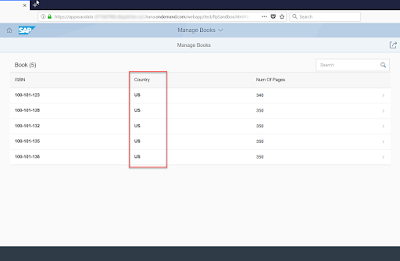 Similarly, when you login with a user with country SAML attribute as “IN”, he would only get records having that value in COUNTRY column from Calculation View. Wrapping the same in xsjs service to display the attributes that are captured at the session level is highlighted below. Also when the user is moved out of the user group in the IdP, he’d automatically not be allowed to access the odata service, since the user will not have the required scopes. And will be presented with the following error message.